Is your dog licking his paws raw? It may well be your pet is experiencing allergies, one of the most common health problems for pets. Just like people, animals have allergic reactions because their immune system–the system that protects the body from foreign and potentially infectious substances–overreacts to some material. Almost anything–pollen, dust, an ingredient in pet food, a household chemical, an insect bite–can set off an alarm in the immune system, causing it to pump out large amounts of white blood cells, hormones, and other material called histamines into the bloodstream. The result for animals can be a range of different effects, including itchy, swollen skin–known as pruritis–difficulty breathing, or a disruption of the digestive tract such as vomiting or diarrhea. These symptoms are the animal equivalent of a person’s sneezing, runny nose, and watery eyes. Pets with these kinds of allergic symptoms can be pretty miserable creatures, and unfortunately they can’t be cured. Allergies are life-long, chronic problems. The good news is that there’s a lot you can do to help your animal “children” feel better. The best way to start is to find out what your pet is allergic to, so you can keep the allergen out of his environment. Animal allergies generally fall under one of four main categories. These are the least common type of allergy in animals. They happen when an animal’s skin comes in contact with the material he’s allergic to–if he rubs his face against a wool blanket, for example, and he’s allergic to wool. The chemicals in flea collars can cause this problem as well. The skin at the point of contact will be irritated–it may itch, become thickened or discolored, have a strong odor, and/or lose hair due to constant biting or scratching. Contact allergies are generally not a hard problem to solve–they’re usually confined to a specific area of an animal’s body, and the allergen shouldn’t take too much work to discover. You can try removing different materials that your pet touches until you find the one that irritates his skin. Diet can be a complicated factor in pet allergies. Most animals are not born with allergies to food; their immune systems develop an allergic response over time to some part of their diet, often one of the animal proteins. A food allergy can present in a lot of different ways, including the itching, digestive disorders, and respiratory distress already mentioned. They can be a real challenge to solve, however. You can try to figure out what’s causing your pet’s allergic reaction by feeding him different diets, but the allergic effects of food can stay in the system for eight weeks. You may have to keep your furry friend on a special hypoallergenic (non-allergy-causing) diet for eight to twelve weeks to see how he reacts, and you may have to do it several times with several different diets before you find one that doesn’t cause an allergic reaction. And while you’re feeding these test diets, you’ll have to make very sure that your pet doesn’t eat any treats, vitamins, leftovers or scraps, or even plants around the house. He has to eat the test diet exclusively for the entire eight to twelve weeks to determine whether he has an allergic reaction to it. Inhalant allergies are the kind we humans are most used to. Just like us, our pets get hay fever, meaning they can be allergic to the pollen and mold that fills the outside air during the spring and fall. They can also be allergic to the dust mites, mildew, and mold that can be inside every home. These kinds of allergens usually produce severe itching in pets, which is usually concentrated in the ears, feet, groin, and armpits, though it can be spread across the entire body. Dogs in particular may develop hairless, irritated “hot spots” from constantly chewing on and scratching the affected skin. Most animals that are allergic to airborne particles are usually allergic to more than one. Often, they will only experience itching during the pollen-heavy seasons of the year, just like humans with hay fever. If you find that your pet’s allergies seem to be seasonal, you may be able to limit his outdoor time during allergy season. Your pet may be reacting to an indoor allergen, however, or an allergen that doesn’t vary by season. In that case, there’s not much you can do to keep him away from whatever he’s allergic to, though an air filter might provide some relief. This is an extremely common problem for pets, possibly the most common allergy of all. Animals aren’t actually allergic to the fleas themselves, but to proteins that fleas secrete in their saliva when they bite. Your pet doesn’t have to be a walking flea circus to suffer from an allergy, either. Affected animals can itch severely from a single bite for over five days! So, if you suspect your pet is allergic to fleas, you’re going to have to work very hard to keep the little pests away. Frequent baths are a good idea, as are the prescription flea applications and pills. Consult your veterinarian when you chose a flea repellent for your pet, though; the wrong kind or too strong of a concentration could cause irritated skin, seizures, and even death in extreme cases. You will also want to treat your pet’s environment, including any bedding or carpeting he comes in contact with. Testing — Your veterinarian has a few different tools to help determine the source of your pet’s allergy. Intradermal or “scratch” tests involve making small abrasions in an animal’s skin and inserting small amounts of materials that the veterinarian suspects the pet might be allergic to. If the animal is allergic to one of the materials, say dust mites or ragweed pollen, the immune system will react to it and that particular scratch will become inflamed. There are also a number of blood tests your veterinarian can use to analyze the amount of certain chemicals that the immune system releases into the bloodstream when exposed to different allergens. These tests can be used to tell whether your pet is having an allergic reaction or whether the problem is caused by something else, and sometimes they can determine the source of the allergy. Steroids — These drugs work to suppress the immune system and make the allergic reaction less severe. Steroid treatment can help your pet even if you can’t determine what he’s allergic to or how he’s being exposed. They can have several side effects, however, and they affect nearly every organ in the body. Steroid use can cause weight gain, increased thirst and urination, and increased aggression and other behavioral changes. They are generally used if the allergy occurs for a short amount of time, because long-term use makes animals more prone to infection, as well as susceptible to diabetes and seizures. Immunotherapy — This is one of the safest and most effective ways to treat allergies, but it also takes the longest amount of time to work. In immunotherapy, animals are given regulary–often weekly–vaccinations that contain small amounts of the substance they’re allergic to. The same therapy is used for people who go in for allergy shots. It gradually desensitizes the immune system to the allergen, meaning that as time goes by, the immune system is reprogrammed and doesn’t react to the allergen as strongly. Unfortunately, it takes some time for the immune system to readjust. It can sometimes be six to twelve months before animals show any improvement from the treatment. Antihistamines — These drugs, much like the allergy medication people take, work to block the chemicals released by the immune system, called histamines. They are effective at reducing itching and inflammation, and they are relatively safe to use. Their major drawback is that they cause sedation, and can make pets extremely drowsy and sluggish. Occasionally, they can change an animal’s energy level enough to affect his quality of life. Symptomatic treatment — Even if none of the above treatments are effective, you can still give your pet a lot of relief by simply treating his symptoms as they come up. There are a number of soothing shampoos on the market that contain ingredients like oatmeal or Epsom salts. Your veterinarian may also be able to suggest ointments, ear treatments, or sprays that can make your pet more comfortable. 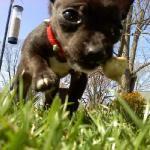 Be cautious about using home remedies or herbal treatments on your pet, however. Consult with your veterinarian before trying any new treatment, because you could damage your pet’s skin or aggravate the allergic reaction. Most of all, remember that while you can give these symptomatic treatments often, they will only provide temporary relief. If your pet still seems uncomfortable despite the baths or other treatments, you can talk to your veterinarian about long-term treatment. Whatever treatment decision you and your veterinarian come to, rest assured that the patience and determination it can take to treat allergies is well worth it. Though it may take some time and effort, you can help your itchy, grouchy pet feel comfortable again.